Every year we try our best to bring you the best live music from the Valley. However this year we have a few bands that are currently on tour and have been hand picked to play at this year’s 2018 Volkstock. If this is your first time coming to Volkstock I promise you will see why so many people come back each year just to check out the live music and have fun with the people they meet along the way. This will be the first time we will officially have a Concert Series which is marked for Friday, November 9th. 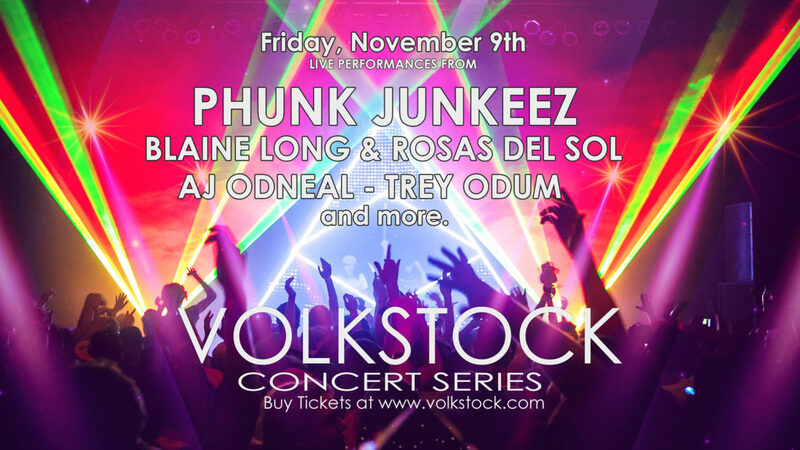 We have packed the stage with top performers like Kuinka, Blaine Long, and the valleys original Phunk Junkies. If you have not seen the Phunk Junkies play you are in for a treat. Here is a list of the bands and the time they will play. When I think of vw’s I think of the classics and when I think of the classics I think of 1960’s and 70’s music. Please play some 60s and 70s music that goes along with old classic bugs. This location is way to far for most of us in the east valley. I have 7 VW not going due to the location. You should try to centralize the location if you want it to become a bigger and better event!